Pacific Ocean day excursion, visiting Washington's Long Beach Peninsula. Plenty of sand on this 28 plus mile beach. Visit a lighthouse, explore if you wish in the Lewis & Clark Interpretive Center, stop in the Columbia Pacific Heritage Museum, ride a horse on the beach, maybe do go carts! Eat some great food, visit a kite museum, stroll the beach, and see what used to be the worlds largest frying pan! This is a great day trip from the Seattle area. This tour is loaded with Northwest Adventure. Long Beach has Cranberry bogs, and depending on the time of year, we'll stop and see harvesting or just look at the fields. 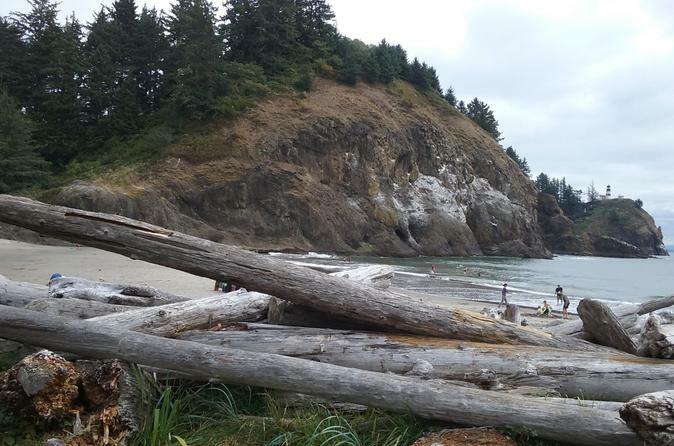 There is plenty of time on the beach at the Pacific Ocean, with driftwood and plenty of sand. Do some rock or shell searching, watch the boats as they maneuver the mouth of the mighty Columbia river, where many a ship has sunk at the massive river exit into the ocean. Learn some history about the explorers Lewis and Clark, the military presence in the area, and the fishing industry. Stop at the North Head Lighthouse and explore the trail to the cliff, see seagulls, maybe sea lions and/or harbor seals. Lunch is included at a restaurant decided once we arrive in Long Beach.